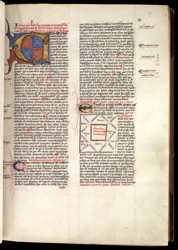 This page has the beginning of a section of a treatise by a 13th-century Tuscan astrologer, Guidi Bonatti. In the second column, a small diagram shows relationships of the zodiacal signs to the sun at a point in time: an astrological chart. A celebrity in his day, Bonatti remained famous through the late middle ages, being included among the soothsayers in the 8th circle of the Inferno in Dante's 'Divine Comedy'.